← NFL Expanding To 34 Teams In The Future? Before I dive in here, I want two things to be known, one, I only used this image because I like the design of it, and do not in any way support the seedings in this playoff system. Florida International? Nevada? UCF? UCONN? In the BCS Playoffs? It’s really a shame I can’t say what I really want to say about these seedings. Also, my roommate Mark suggested a topic for my blog and I want it to be known publicly that it will be done later this week, I just don’t have the energy to do it tonight. ESPN reported earlier this week that West Virginia was dropping Florida State from their schedule for next year and was going to pay $350,000 so they don’t have to play them. That part of their contract is known as their “escape clause.” Florida State now has to find a replacement game for West Virginia and has to decide if they want to go to Morgantown next year. The issue that arises here is the lack of non-conference games that highly ranked opponents want to play against each other. Of course you will always get a handful each year, and Michigan/Alabama in Dallas should be an interesting one, but because of the BCS, nobody wants to play a serious non-conference team and that’s why Michigan plays at least two MAC-esque teams each year. The one thing I LOVE about college basketball is the amount of games that big time programs play against each other each year before conference play starts. They simply don’t worry about whether or not the loss will end their national championship run or hurt their ranking. If there was a football playoff, the likelihood of ranked teams playing against one another in their non-conference games goes up exponentially, and greatly reduces the amount of MAC teams that invade the Big House each autumn. This is yet again another example of the BCS ruining college football for everybody. Not only do we as viewers get stuck with garbage rematch games in the National Championship, but they make teams worry about playing tough teams and ruining their perfect season before it even starts. Florida State now has to fill that open week slot as soon as possible, which won’t be easy because most teams make their schedules years in advance, and now will probably end up playing a Division I-AA team (I refuse to call them FCS schools, don’t even get me started). The only good development is that the Big Ten said today that they are discussing a proposal that would have a 4-team playoff and the semi-final games would be on college campuses, in place of the current system (Chicago Tribune). This is obviously in the proposal stage, but Big Ten President Jim Delaney was a huge supporter of leaving the BCS as is, and getting him on board with the idea of a playoff would be a huge momentum shift. Only time will tell if the BCS will finally change and stop ruining college football. 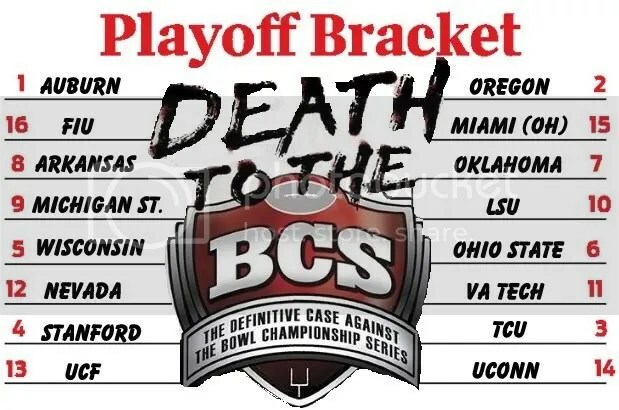 Death to the BCS. This entry was posted in College Football and tagged Alabama Crimson Tide, BCS Playoffs, Big Ten, College Basketball, espn, Florida State, The Big House, University Of Michigan, West Virginia. Bookmark the permalink.